Home » Snuggle-Pedic Mattress Giveaway! It’s time for another epic mattress giveaway here at Sleepopolis! Up for grabs is a cuddly-cool mattress from Snuggle-Pedic, and as always, the lucky sleeper will get to choose the size that best suits their lifestyle. All you have to do is enter for your chance to win, and then let the snuggling begin! 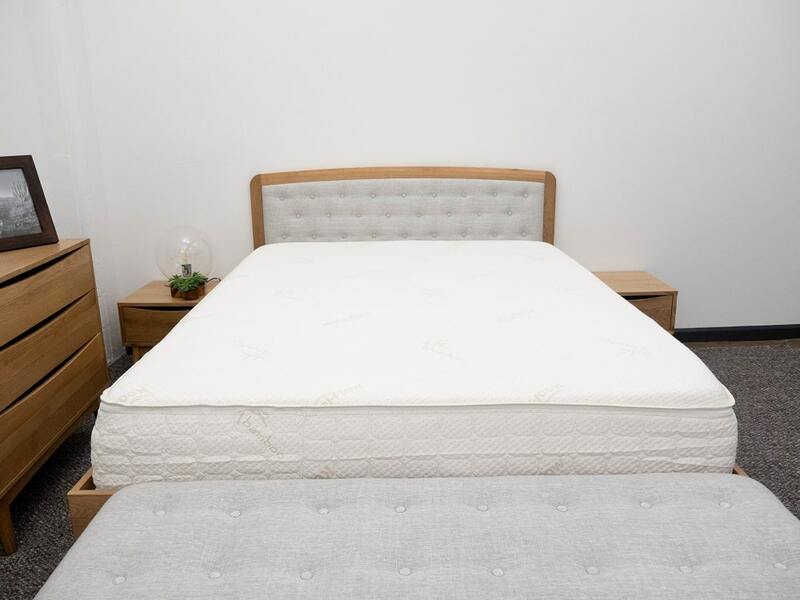 The Snuggle-Pedic mattress is designed with an enhanced airflow system composed of an aerated top layer of memory foam, and air channels along the poly foam support section. So if you’re a hot sleeper, this bed is a good defense against those sweaty, summer nights. Speaking of foam! The Snuggle-Pedic offers a thick top layer of dreamy memory foam. 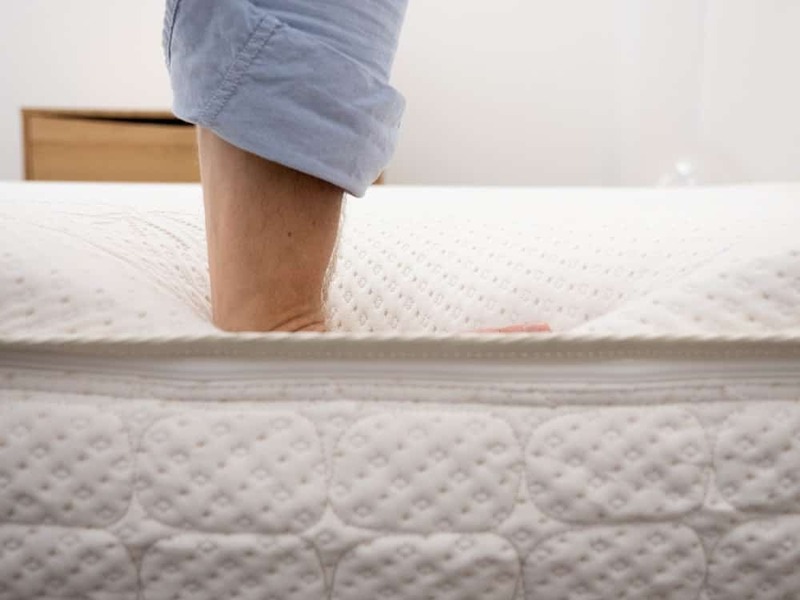 Lots of folks love the cozy memory- foam-sink, but side sleepers might especially benefit from the comfy contouring it provides the shoulders and hips. Not to mention, it actively works to absorb and contain motion! So, if you plan on sharing your bed with a partner (or a pet), you won’t feel them tossing and turning while you sleep. So what do you say? Ready to get your Snuggle on? Enter now for your chance at this soft, breathable bed and don’t forget to read the full written review for some extra inspiration! Good luck, gang! My current “King Size” mattress is two twins pushed together and I share with my dogs. Not the best situation, nor the most comfortable. I toss and turn all night and I am always stiff and sore when I get up in the morning. This sounds Heavenly! It sounds great. I need a cooling mattress that provides firm support. I could really use this mattress. Coil mattresses are terrible for my back. Being a side sleeper myself his mattress would be perfect for me, it’s time for a new mattress. This mattress system looks so inviting! Thanks for giving us all a chance to win. I think this mattress seems great! I love memory foam. So, I would love to have this mattress because of the memory foam. It looks extremely comfortable. I could go for a good nights sleep on a comfortable mattress for a change. Mine is so old I think Moses may have slept on it back in the day. Thank you Sleepopolis for this great opportunity to have a chance to own such a comfy bed! I am strictly a sice sleeper, and my husband and I do tend to get pretty hot sleeping next to one another on our current mattress. It would be such a blessing to wake up refreshed and ready to start my day! I just wanted to add to my post that I just found out I’m having another little one and I’m starting a new job in a few days, and I am so blessed! The Snuggle-Pedic is just what we need and I would be absolutely elated to be able to snuggle my hubby and babies on this amazing mattress. Love that it sleeps cool, Thanks for the great Giveaway! Good luck everyone. My dog had bladder stones and leaked all over my current mattress. Would SO love to win this. Ty for the chance. A great mattress. Sounds comfortable.Good air flow. The Snuggle Pedic looks like a WONDERFUL mattress. Souds like it would be very comfortable. Thanks for the opportunity to WIN. It looks so amazingly comfy! My husband works so hard but can never get sleep because I can’t get comfortable and toss & turn all night long. He also is an Army Veteran who suffers from PTSD, so he really needs to get a deep sleep and usually doesn’t. Thank y’all for the chance! Fingers crossed I’m the lucky winner! This sounds like the perfect mattress for me as it seems soft, comfortable and cooling. Looks like heaven to sleep on! Between my boyfriend’s hot sweaty sleep and my bad back pain this seems to be perfect. I am a side sleeper so as I was reading your review of this mattress, I knew it was the one for me! It sounds like the perfect one to finally help me get a good night’s sleep. My current mattress is the worst and needs to go! Thanks for this fabulous giveaway! I’m a side sleeper and think I might like to try this mattress. I’d be in heaven with such a mattress. Looks like such a comfortable mattress! Lives up to its name I hope! I love that even though the snugglepedic is breathable even though it is a foam mattress. It sounds like a great mattress that would help me sleep better. I am full of arthritis and toss and turn during the night. Thank you for the chance to win! Love the name lol and we are definitely in need of a new mattress. How heavy is the mattress? How easy is it for a single person to move it from room to room or house to house? Well constructed mattress with an affordable price. I think it would be a big improvement over the one I have and love the idea of memory foam-have never had one with it. Snuggling in this mattress will get me fired at work ….and smash my alarm each time it blows off. I need the dust mite resistance. I am allergic to them, and they always seem to find me. Maybe I could quit itching myself to pieces all night. Hypoallergenic is great also since I am allergic to everything. I love the name too. Makes you just want to snuggle up. There’s nothing that sounds better than to snuggle up in a mattress with the name “SnugglePedic”. I would love to win this mattress and have a great night’s sleep in it. It looks as it it would contour to my body’s pressure points and be very comfortable. I like that a lot. I could definitely use a new mattress. This one sounds amazing . Would be perfect for me . The fact that this mattress helps with keeping cool sold me. I started having hot flashes this year and sleeping has been difficult. Any cooler mattress will help me. It looks and seems comfortable and good quality. I have a bad back and neck and could really use a new mattress. Thank you for the chance! I need a new mattress and this one looks really good. Thank you so much for the chance! Hypoallergenic & Dust Mite Resistant is exactly what I want along with comfort. Thank you for the opportunity to win! Seems like a nice mattress but most mattresses ordered on Amazon are subject to the 30 day return policy. You have to purchase directly from them to get a longer trial period, but I couldn’t add any products to the cart on SnugglePedic.com. Is this one different? I suffer from chronic, constant neck pain… This sounds like the mattress that will help me finally get a good night’s sleep!!!! I like the idea of the cool needs & bamboo cover.. This mattress sounds like a cool sleeping experience! This mattress sounds like great night sleep! I tend to sleep on my side and my hubby sleeps on his back a good fit for us both. Love the cooling effect! Oooo, this mattress sounds perfect for me and my husband! If it keeps me cool then I’m all in. I sleep on my back & occasionally my side so this would be perfect for me. I’m disabled & in chronic pain with the old mattress I’ve got now so this sounds great. I run hot year round & living in the desert doesn’t help so a cooling mattress is fantastic. Keeping my fingers crossed. This looks wonderful, I would just love a good nights sleep. This looks so comfy! Thanks for the opportunity to win one. I like it. Sounds like it would be the perfect sleep for me. All the descriptions and reviews fit my needs. Thanks for the chance!! My body temperature seems to go up when I lie down so having a mattress that helps keep me cool would be nice. I am also a side sleeper with chronic pain so I need a mattress that addresses this problem could bring me a better nights sleep. For this side/ back sleeper, I’m happy that it’s a softer mattress & is cooling! Sounds really nice! Need a new comfortable bed, this sounds great! My husband sleeps so hot so this mattress sounds like a dream! Thank you so very kindly for the opportunity! Enjoy your week! I would love to try this bed out! It sounds heavenly. This just makes me want to snuggle! This mattress looks so soft and comfy! Looks like I’d finally be excited to go to bed! Incredibly bed. I wake up soaked and hate it so this definitely sounds good for me. Love the bamboo. Thank you so much for all these amazing bed giveaways. As a side sleeper, the Snuggle-Pedic sounds like it might really be right for me. I’m a side sleeper so this mattress would be great for me! I have Chronic illness so much pressure points hurt badly when I’m laying down. I bet they won’t with this mattress! I like that it has an enhanced airflow system to keep you cool at night! Could it be this would be the perfect mattress for me, finally lol?! I’m a strict side sleeper who definitely sleeps hot and I really love a softer in-the-bed feel. Tried looking during 4th of July sales yet I was still so unsure what would work for me, this one sounds marvelous. Thanks for the review! I love that the Snuggle-Pedic offers a thick top layer of dreamy memory foam. Lots of folks (like me someday) love the cozy memory- foam-sink, but side sleepers (like Me) might especially benefit from the comfy contouring it provides the shoulders and hips. Not to mention, it actively works to absorb and contain motion! I might plan on sharing this bed with my hubby (and definitely my cat), I certainly won’t feel them tossing and turning while I sleep. I am so excited for a chance to win the Snuggle-Pedic. Its the middle of summer and this is the perfect bed to keep you cool at night. I love the airflow in the memory foam, its such an innovative design! It would be so cool to win!! Well I am a side sleeper so this seems to be the perfect mattress for me. I have NO furniture at all.